J.J Kavanagh's EvoRa bodied Volvo B8RLE, 181-KK-1442, is seen at the Blanchardstown IT terminus of new Route 139 on the 26th April 2018 (click on photo for larger version). 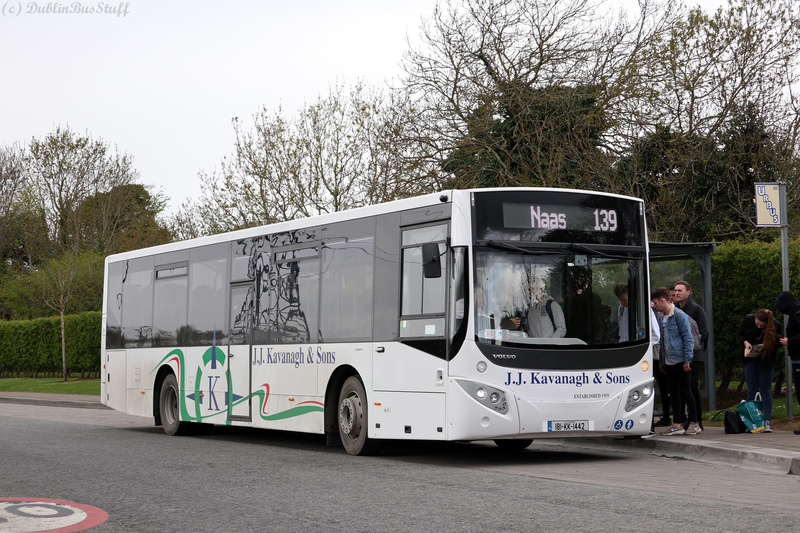 Route 139 began operation on the 12th March 2018, operating from Blanchardstown IT to Naas. Typically DublinBusStuff doesn't cover hinterland Dublin services, principally keeping away from coach services. However, the 139 is more of a city bus operation, with city bus vehicles. This is especially the case in Blanchardstown/Ongar where is operates at all stops, an alternative service from Ongar to Blanchardstown Shopping Centre for example. It also serves Leixlip, and the Intel Campus, Maynooth, Rathcoffey, Clane, Sallins and Naas. It is quite a logical routing serving some key locations on the west side of Dublin/East Kildare border. It is operated by J.J. Kavanagh & Sons of Urlingford Kilkenny, using 2 Egyptian bodied EvoRa Volvo B8RLEs (the other being 181-KK-1441). The service provided is approximately every 2 hours, with generous running time on its 9 daily departures. The only downside is that it doesn't operate as a full service between Clane and Naas, being only allowed to pick up going from Naas, and only allowed to drop off heading to Naas (except on Sundays and late evenings when it is allowed). This confusion is unneccessary for a public service. I'm guessing the reason is cause it would compete with J.J. Kavanagh's existing service between said places. 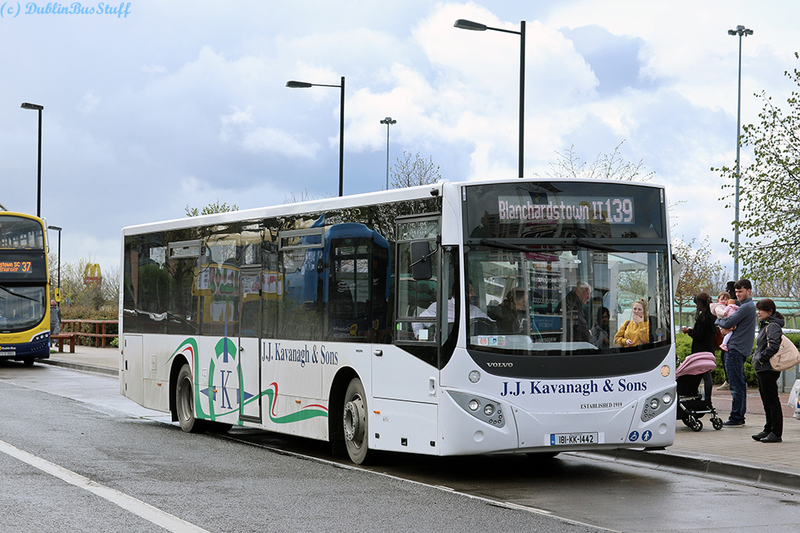 J.J Kavanagh's EvoRa bodied Volvo B8RLE, 181-KK-1442, is seen at Blanchardstown Shopping Centre operating Route 139 on the 26th April 2018 (click on photo for larger version). 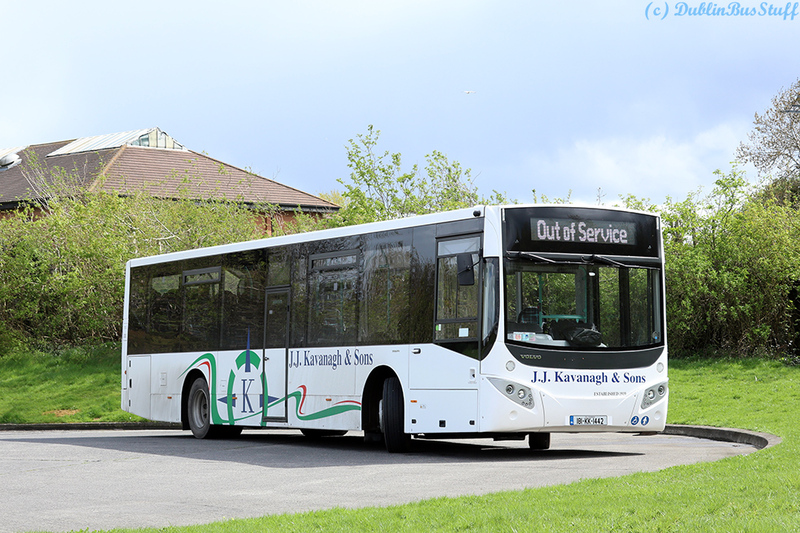 181-KK-1442 at the turning circle in Blanchardstown IT awaiting its return departure to Naas on the 26th April 2018. This turning circle was previously used by Route 38B before its cancellation and is also used by Express Bus Route 839, which links Blanchardstown IT and Coolmine Station via Blanchardstown Shopping Centre. Interestingly all passengers bound for Blanchardstown SC used the 839 on this departure, the cheap weekly fare probably being the reason (click on photo for larger version). Map snippet showing Blanch IT. The bus stop in the top photo is on the north side of the road heading out of Blanch IT, the turning circle is seen on the left heading into Blanch IT after the pylons. Buses turn left off Blanchardstown Road North at the roundabout, straight through the next roundabout and then left into the turning loop. Buses loop there before serving the bus stop.